In the Maths department, we want to make sure that parents feel as though they have all of the information that they need about the way that Mathematics teaching is structured at NLCS. If there is any information which you feel would be useful to you, please do ask us by using the form below. This page also contains useful and interesting information about Mathematics and young women. Should you come across something which you would like us to include here, please do email it to mcopin@nlcs.org.uk. What should a student do if they miss a lesson? ​If students know in advance that they are going to miss a lesson, they should ask a friend to pick up any extra handouts and worksheets for them, and photocopy their notes and classwork. If a student misses a class without warning, they should first ask one of their classmates what the notes, classwork, and homework were. Some classes have a WhatsApp group on which students can share work and ideas - this is often useful. Once they have copied out the notes, read the textbook (including trying any examples), and attempted the work, with some help from friends, they can then come to the teacher for clarification on any extra points. In the Sixthform, all A Level students have an account on Integral Maths, which contains full notes, exercises, worked solutions, and little online tests. Students can use this to catch up. Teachers will always be happy to help students once they have gone through these steps to ensure that they fully master the material. How much homework should my daughter be getting? 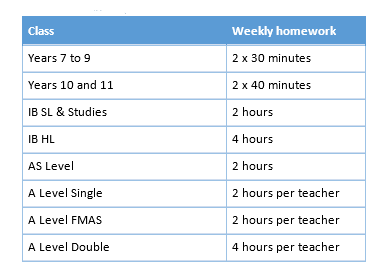 The table below shows the weekly homework girls are set. How is assessment structured in Years 7 to 11? There are three types of ‘testing’ assessment that can take place. "Layer Tests" or "End of term Exams" are done across a year group. There will be a mixture of questions including some stretching problems. Quick checks are also done by all students in a year group, usually at the end of a topic. These will often take only 10 minutes. Their purpose is to ensure that the essential methods have been learnt. Teachers may also decide to set their own class progress check on a particular topic or set of topics. What is "Ad Maths"? Who does it and what purpose does it serve? Ad Maths is a stand alone course (OCR FSMQ) which complements and enhances the IGCSE course. It includes topics further algebra, coordinate geometry, enumeration, numerical methods, and calculus. Ad Maths is completed by the top two sets at NLCS. Sets 3 and 4 cover a reduced form of the syllabus, providing essential preparation for courses such as IB Higher Level, Further Mathematics, and Further Mathematics AS. An outline of content being taught is given on the Year 10 and Year 11 pages, where Ad Maths content is indicated by green font. There is no setting in Year 7. In Year 8, two forms are split into three classes. The other three forms are split into four classes. In Year 9, we have six sets. All classes cover the same core work and include appropriate extension work for the students. Setting is decided carefully, taking into account evidence from class, homework, and examination performance. We operate on the principal that a student will thrive in a set which is right for her. Our expectation is that students in all classes are able to achieve a level 9 at IGCSE, and we work towards this. There is therefore no advantage to being in a particular set. What IB Mathematics Course should I pursue in Y12? The most important thing is that you will enjoy and be able to access the course that you choose, if this is the case then you will naturally do well at the subject which, in turn, will help you get into a suitable course at university. Higher Level Analysis and Approaches: Recommended for a student who loves Maths and finds that tricky algebra and complicated calculus comes naturally to them. This course is likely to be required for application to Mathematics or more mathematically rigorous courses (such as Engineering at Imperial); note that if the first point doesn't apply to you then you aren't going to enjoy these courses at university anyway! Higher Level Applications and Interpretation: Recommended for a student who really enjoys Maths, particularly when it is applied to solving real-world problems. There is a greater emphasis on statistics and use of technology to solve problems. This course would be a good option where a HL Maths course is required for an applied science course (such as Bio-Chemistry at some universities) or for someone applying to a social sciences course (where the statistics would be really helpful) but wants to keep on doing lots of interesting Maths. Standard Level Courses: The two courses in SL are divided in the same way as HL but with about half as much content. There is a large proportion of shared content so we will initially teach all SL students together, before making a choice about different options later in the year. How can I support my daughter's mathematics? Three thoughts spring to mind! Don't worry. We're on it. Students work best when they take ownership of their learning: it's great to discuss with your daughter what she thinks she'd like to improve and encourage her to speak to her teacher about what she could do more of. When sitting down to do mathematics with your daughter, then do enjoy it! Talking about abstract concepts is interesting, as is articulating thoughts: "I wonder why that's true - can you explain it?". Practicing a method (completing the square, or constructing centres of rotation) until you really nail it is fun too. If in doubt, speak to your daughter's teacher. How are the Year 12 Summer Examinations set and marked? On the IB pathway, the department policy for the last five years has been to take a 'real' set of papers, and replace any questions on topics which students have not yet studied. This is an excellent opportunity for students to see what the reality of the Group 5 examinations will be like. On the A Level pathway, where there is a new specification, the practice is to set the specification's AS paper. This only covers topics which students have already studied, and OCR has set it at a level which is fair for a student who has just completed Year 12. This gives a reasonable assessment of a student's level relative to the expectations of the examination body. At NLCS Maths, we were disappointed to hear that a very recent PISA (Programme for International Student Assessment) report stereotyped girls as helpless mathematics students who are "passively driven by parental, educational and/or general forces beyond their control". 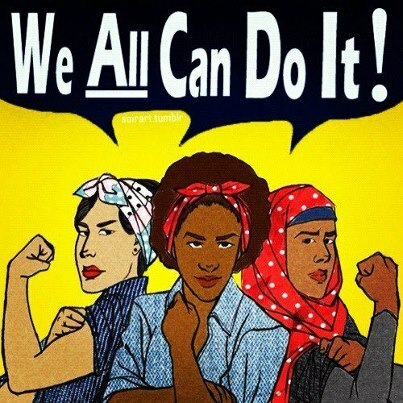 Not only do we disregard any notion that certain students are innately inferior because of their gender (or any other aspect of their identity) but we believe that all of our students should have the confidence to disprove these archaic notions! Believe in Your Maths Potential - Set Yourself Free! ​A short article on the benefits of studying maths at A level and beyond. ​A great resource on girls' participation in maths nationwide amongst other things. The Institute of Physics state that if as many girls studied A level physics as boys, there would be 15,000 more young people qualified in high-skilled roles across the economy. A very recent poll has shown that boys are almost TWICE as likely as girls to call themselves a "natural" at maths. We think this needs to change! Don't you? The women at the School of Mathematical Sciences at University of Nottingham have made some videos to: become more visible and thus hopefully inspire others; communicate the passion they feel for what they do and what they love about it; fight stereotypes; talk about what it is like to be a mathematician in academia today and why they chose academia; describe the creativity needed for research. Lots of interesting perspectives around the world. Sandberg's Lean In has been popular recently but this article gives a useful perspective on communities it ignores or excludes.